PIARCS’ target transportation fuel market, assuming a licensing fee of $0.05/gal per year, would generate on the order of $17bn per year from biofuel producers in the US and Europe alone. PIARCS’ goal is to enable median US algal lipid productivities on the order of 7,500 gal acre-1 yr-1 in open ponds and a corresponding fuel production cost under $92/barrel. This price estimate was based on the NREL study by Davis et al. assuming that 50% of the operating cost scaled with biomass productivity, as well as nutrients recycling levels of 37% phosphorus, 68 % nitrogen and 69% CO2. The scientific basis of the novel approach is detailed below. Cell division occurs in fish when 10 pellets have been processed into biomass. Fish A can take a maximum of 4 g pellets per hour, and turn 2 g into biomass, while fish B can take a maximum of 1 g pellets per hour, and turn 1 g into biomass. What is the fish A division time in hours? What is the fish B division time in hours? What is the fish A biomass yield, in g biomass produced per g pellet feed? Which fish grows faster? Which fish grows more efficiently? Which fish would you choose to grow in your pond? PIARCS’ novel reactor designs, which are described in the PCT application, are suitable for outdoor ponds and scalable to large-scale biomass and biofuel production. Tuning of PIARCS’ lab-scale prototype to produce high yield lipids continuously under high light. Under nutrient excess, single-celled microbes divide at a constant speed, while under nutrient limitation, these microbes process nutrient energy with constant efficiency. PIARCS’ founder performed an energy balance on the algal reactor by treating photons as discrete feed particles akin to sugar molecules for bacteria. The far-reaching growth model resulting from this analysis simply states that the rate of algal biomass production is proportional to the photon flux absorbed by the algal culture. The biomass production rate proportionality constant is the autotrophic yield, which is an efficiency parameter in grams of biomass produced per mole of photons absorbed. While this simple growth model holds under low light conditions, leading to the well-known linear growth phase which follows exponential growth, this linear regime commonly fails under high light conditions such as outdoors. Why is this? 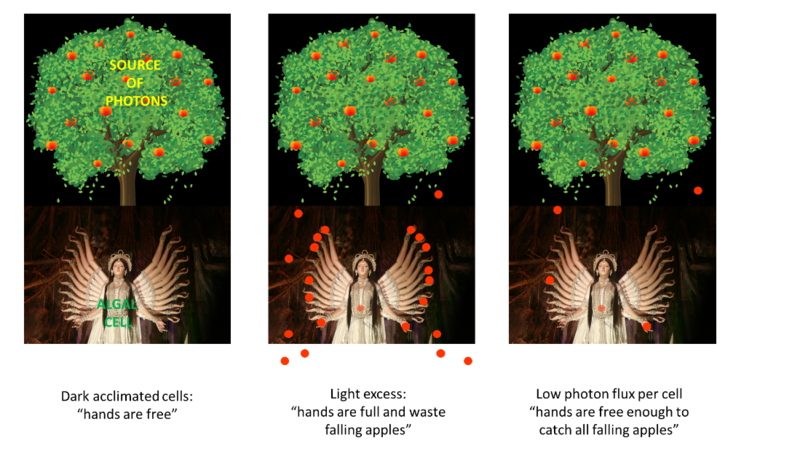 Therefore, to avoid the waste of photon energy into heat or fluorescence, one must ensure that the algal cell reaction centers stay mostly open, which is the case under low photon flux per cell (LPFC). PIARCS’ novel reactor designs, which are described in the PCT application, ensure LPFC while limiting energy requirements associated with the targeted vigorous mixing. The patented designs are suitable for outdoor ponds. Under this LPFC condition, the outdoor rate of algal biomass production is proportional to the irradiance as well as to the cultivation area. Thus, productivities should be reported on an area basis with a specified irradiance, and not on a volume basis with loosely described geometry and light levels, which is often the case in the field. Large-scale algal biomass production should be treated akin to crops, for which productivities are reported on an area basis, with the added benefit that algal biomass production is directly proportional to irradiance. Many species of eukaryotic algae accumulate lipids (the main precursor to algal biodiesel) as a response to nitrogen exhaustion. In the absence of a predictive growth model, current processes involve two steps, which drastically impairs overall productivity. In the first step, algae are grown under nitrogen excess, and in the second, the algae run out of nitrogen and accumulate lipid in a growth arrested regime. Thanks to PIARCS’ growth model, mild nitrogen limitation (namely a mild photon excess per fed nitrogen molecule) will be effected continuously, so as to maintain continuous biomass production. The resulting limited trade-off between lipid accumulation and biomass production should give rise to an optimum lipid yield.